Born with the Sun in Virgo, you now have Jupiter, the planet of opportunity, in your own sign for the first time in 12 years. Between now and your birthday in 2016 you will have access to the best hairdressers or cosmetic surgeons, if you want them. Born with the Sun in Virgo, you now have Jupiter, the planet of opportunity, in your own sign for the first time in 12 years. Between now and your birthday in 2016 you will have access to the best hairdressers or cosmetic surgeons, if you want them. You will also find exactly the right new clothes and accessories, to flatter your shape and give you the style statement you need. Jupiter is rarely in your image zone, which the sign of Virgo rules, and you will notice the impact of this new cycle most from the final week of August 2015 through the third week of September as you experience what is known as the Solar Return. With Pluto on my natal Saturn in my 5th house and Saturn traveling through my 4th house (finishing up, thank God) do you see some good things coming for me? The last 3, but really the last 12 years have been the hardest of my life. Ready for some rewards. You have an amazing web site, so much information. I’m a life long learner!! Thank you very much. You may want to enter your birth data again as I have a message saying I can’t see your birth chart until this happens. Sorry. However I can read Pluto on your natal Saturn in Capricorn (assuming this is the sign). In the Natural House System this places your birth Saturn in the Tenth House and Pluto is now transiting there, transforming the balance of power in your chosen field, business, profession or industry. As you were born to receive lessons – quite hard ones – about success, achievement, status and position – this is going to be a time of intense transformation. It helps to examine your fears. There is a part of you which has very good reasons indeed to feel vulnerable about your C.V. and also the business of becoming successful – a couple of hard knocks have already taught you that. This is not the whole of your life, however, and neither is it the rest of your life. The trick with Saturn is to make sure you are neither under-protected nor over-protected. The astrologer Sue Tompkins has some wise things to say about this. If you remember that Saturn has rings around it, you get the idea of boundaries, defences, protective walls, moats and so on. The planet tells us about the astrology. There is a part of you which is encircled by defences, safety measures, and an awful lot of ‘methods’ you lean on, to make you feel safe. As Pluto conjuncts Saturn in your Tenth House of achievement you will really feel this challenged and changed. This takes time and a reasonable amount of courage. However you are approaching the time of year when the Sun’s transit through your Tenth House (from just before Christmas until the end of January) will illuminate everything you need to see, so that you can make progress. This can only happen around every 240 years. Give it space in your life and read as much as you can about both Saturn and Pluto. I updated my birth data, sorry, had to add the : in the time of birth. Pluto does enter my 6th house in December…Im hoping it is an easier transit?? Thank you. I use the Natural House system so you actually have Uranus in your Fifth House in Leo, alongside your Ascendant and Fortuna. This may explain a few things. You are here to explore the many different ways you can have a younger generation in your life, and these may range from professional or voluntary involvements with children and young adults – over the years – to massive decisions about becoming a mother (or not). This has been more of an issue over time, so if you look back at your life history you will see the pattern. In terms of easy or tough transits, you should be very happy to see Jupiter moving into Libra in the second half of 2016 as the time has come to mine a partnership for rewards. 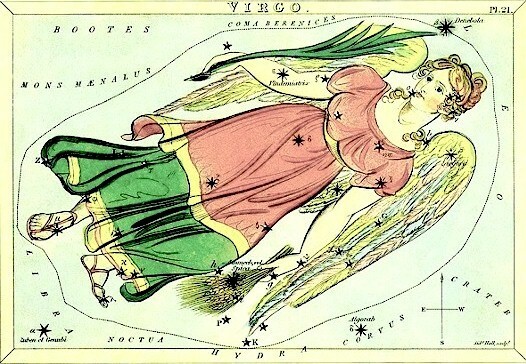 With Jupiter in Virgo 2016 should be a great year for Virgoes to come into their own yet March predictions (starting since Feb) you’ve mentioned putting in boundaries where current partner is concerned and that March can be chaotic. In what way? I particularly love your reference to a fuzzy black and white Hollywood movie, lol. But if boundaries are not put in and this Virgo continues to not live in reality happens? I am more and more facinated by your astrology and hoping to learn more along the way! Do you discuss the impact of the March eclipses? Actually Jupiter in Virgo is not that big a deal for Virgo people – it just means a conjunction from Jupiter to the Sun in the Sixth House, so although there will be a big expansion of your profile in terms of your body, or your work, in this cycle (until September) that’s about it. I am guessing you are asking about your partner, as he/she is a Virgo? March brings confused and confusing situations for/with this person until the ‘unreality’ is faced. Thanks very much for your compliment and I hope you continue to learn about astrology. I discuss the March eclipse in a general story on the Pisces stellium in March which you can find elsewhere on the website. Thank you for that insight into Jupiter in Virgo, everywhere else I have read before becoming a premium member here makes it out to be so much more. Hopefully the “unreality” as you call it is dealt with in the correct way. Guess it would influence the rest of the year until it is dealt with? Definitely good to know. thank you for a great job you make ! As me and my partner trying to have a baby for some years and we have yet tried a lot of treatments without result, i would like to ask you if this year (see the position Pluto and Jupiter) is the crutial? When this year is the best time as for their positioning? You have answered me once by mentioning big cluster in Leo in my chart. It is up to me looking for the possibilities how to be or work with children, even till now I didnt see them in my everyday life or it will come spotaneously when it is right time. I just don ´ t want to miss it. And honestly till now I dont feel lucky influence of Jupiter in many areas of my life even I make lot of effort – work, baby….:-(. Why is it so? Thank you for all , Jessica! Thank you for your kind comments. I can only repeat what I may have said before – one way to unlock the situation is to look at varied/different ways of having babies, children or teenagers in your life. So be honest with yourself. Would you adopt? Would you foster a teenager for weekends? Would you accept someone else to be surrogate? Would you be okay with taking paid or unpaid work around children? There are so many ways to ‘parent’ in this life and it can be frustrating and tiring to keep going down one path (pregnancy) and not see results. Sometimes just loosening up your questions and answers to yourself helps unblock things. Would you be okay just being a godparent? Aunt? All those answers help you relax and play with different ideas. The body is obeying the mind and spirit here. You need to ask your body why it is resisting pregnancy. What are you getting from this situation? This might sound like a really crazy question because you may think ‘Nothing’ but have a look at what this fertility waiting game is doing for you/to you and see what it achieves. Sometimes it brings couples together – it can be very powerful glue that sticks you together when nothing else would achieve that. Sometimes it costs so much money that you both put a price on the cost of love…You will have amazing insights and answers into what is really going on for you in the final week of July and first three weeks of August, okay? There is always a reason for this kind of quest for children and it has many levels of meaning. Find all the meanings. Thank you very much Jessica for your support through your advice!